Want to learn more about growing your own food? Canning and preserving? Or rainwater harvesting? GROW YOUR OWN FOOD with Benjamin R. Eichorn, internationally renowned expert on edible gardening and author of Edible Gardening: Ten Essential Practices for Growing Your Own Food. 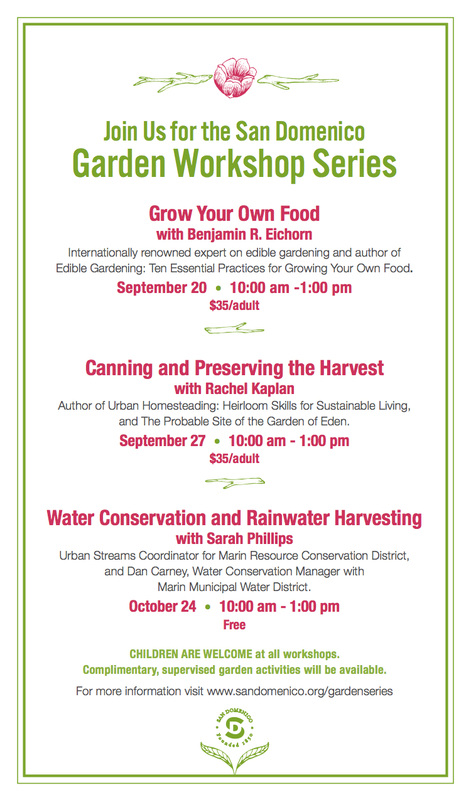 CANNING AND PRESERVING THE HARVEST with Rachel Kaplan, author of Urban Homesteading: Heirloom Skills for Sustainable Living, and The Probable Site of the Garden of Eden. WATER CONSERVATION and RAINWATER HARVESTING with Sarah Phillips, Urban Streams Coordinator for Marin Resource Conservation District, and Dan Carney, Water Conservation Manager with Marin Municipal Water District.